Sharif: Pakistan Is "Drowned In Blood"
Opposition leader Nawaz Sharif accused Pakistan's U.S.-allied president Monday of ordering anti-terror operations that have left the country "drowned in blood," in his first major campaign speech since the slaying of Benazir Bhutto. Bhutto's opposition party, meanwhile, said it may work with President Pervez Musharraf after the Feb. 18 parliamentary polls, despite his apparent unpopularity and allegations that elements within his government may have been involved in the former prime minister's assassination over two weeks ago. The developments highlight the fluid nature of Pakistani politics ahead of the polls, which the United States and other Western nations hope will usher in a period of stability as the country battles rising attacks by al Qaeda and Taliban militants. In the latest violence, suspected pro-Taliban militants ambushed a military convoy in a tribal region close to the border with Afghanistan, sparking a clash that left 23 fighters and seven troops dead, said army spokesman Maj. Gen. Waheed Arshad. Sharif, who was ousted by Musharraf in a 1999 coup, made his comments to a rally of 3,000 supporters near the capital, Islamabad. The criticisms were among his harshest of Musharraf and his alliance with Washington forged after the Sept. 11 attacks and appeared aimed at gaining support from conservative Muslims. "Musharraf has destroyed Pakistan. He is blindly following America's orders," said Sharif. "The whole of Pakistan is drowned in blood." 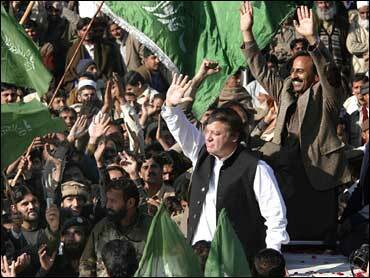 Sharif heads a secular party but in the past has forged ties with hard-line Islamic parties. He alleged the army left "girls riddled with bullets" when it raided a pro-Taliban mosque and female seminary in the capital last year. The government said more than 100 extremists were killed in the operation, and disputed claims that female students also died. Musharraf, who late last year gave up his position as army chief, faces the prospect of a hostile parliament and possible impeachment if the opposition do well in the elections. Many expect Bhutto and Sharif's parties to improve their current representation in parliament, but it remains to be seen if they can secure the two-thirds majority needed to force him from office. A spokesman for Bhutto's Pakistan Peoples Party said "all options are open" when asked whether it would cooperate with Musharraf. "These are bridges which we will cross when they come," Farhatullah Babar said, echoing remarks reported in Pakistani media by Bhutto's husband, Asif Ali Zardari, now the de facto head of the party. Many analysts predict any cooperation between Musharraf and Bhutto's party would be short-lived and unstable, given likely opposition by the group's rank and file. But it would represent a matchup of secular, moderate forces and, as such, could be welcomed by the West. Adding to the uncertainty, opposition parties are threatening to reject the results of the elections if they are rigged. That would deepen Pakistan's political turmoil and likely trigger street violence. Bhutto was a secular politician popular in the West for her opposition to hard-line Islam. The government has blamed her Dec. 27 murder in a gun and suicide bomb attack on a prominent Taliban commander who had reportedly threatened to kill her. But her political party and family members have accused the government of failing to provide her with sufficient security. Some have made vague allegations that elements within the government may have been involved. A bomb hidden in a fruit cart killed four people and wounded 14 others Monday evening in Pakistan's largest city, Karachi, police said. It was not immediately clear who was behind the blast. Islamic militants have been blamed for a growing number of bloody attacks in Pakistan, but violent crime also plagues this volatile city of 15 million people. Sindh province Police Chief Azher Farooqi confirmed the incident. "Yes, it is blast of an explosive device under a fruit cart," he said. Dr. Kalim Shaikh of Jinnah Hospital, one of the Karachi's largest, said the hospital had received four bodies and nine wounded victims. Police said a total of 14 people were wounded. They said that after the explosion, enraged local residents hurled stones at passing vehicles. Suspected Islamic militants ambushed a military convoy in northwestern Pakistan on Monday, sparking a clash that left 30 dead, the army said. The insurgents said they captured 17 troops in the attack, but denied suffering any fatalities. The fighting broke out when security forces retaliated in Mohmand, a tribal region near the border with Afghanistan, said Maj. Gen. Waheed Arshad, the army's top spokesman. The convoy of paramilitary troops was traveling from its base in Ghalanai, the main town in Mohmand, to Mohammed Gut, when it came under fire as it passed through a Taliban stronghold, said Murad Khan, a Ghalanai resident. Arshad said 23 insurgents and seven soldiers died in the fighting. Maulvi Muhammad Umer, spokesman for Tehrik-i-Taliban, an umbrella group for various pro-Taliban forces, claimed responsibility for the attack. He denied that the rebels had suffered any fatalities, acknowledging only that "some of our men sustained injuries during the clash." Umer also claimed the insurgents captured 17 troops during the action. The army said it had no information on any missing security forces. Meanwhile, gunmen abducted and shot to death a political activist who had backed the military against armed supporters of a pro-Taliban cleric in the northwestern district of Swat, said Ghafoor Rehman, the slain man's brother. Rehman blamed the killing on followers of the cleric, Maulana Fazlullah, who have been battling security forces in the mountainous region since July. In Tank, a town on the edge of the South Waziristan tribal region, security forces captured 31 militants and sealed an Islamic school because it was being used as a militant base, the army said in a separate statement.